Since opening in 1930, Publix associates and customers have helped Publix grow from a single store into the largest employee-owned grocery chain in the United States. Since the beginning, Publix has aimed to be the premier quality food retailer in the world. Publix is committed to passionately focused customer value, intolerance of waste, and the pledge to be responsible citizens within each and every community Publix is located in. When asked how much he would be worth if he hadn’t given away so much, Publix founder Mr. George responded with a humble, “Probably nothing.” Mr. George loved serving our communities, and his legacy lives on as our associates do the same today through our corporate and local campaigns. 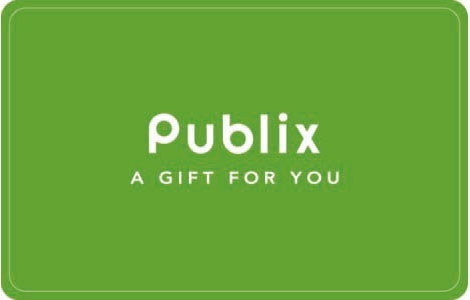 Buy your Publix gift cards from National Gift Card, the best place for you to order gift cards in bulk. National Gift Card is the leading expert in all things gift cards and we want to set up your gift card solutions program for you today. Please reach out to us for more details on direct-to-recipient or individual gift card fulfillment for your gift card program. Check out our contact page or call us at 888-472-8747 today! NOTE: Additional denominations available with a minimum purchase of $5,000. Protect this card like cash. Use of this gift card constitutes acceptance of the following terms: This gift card may be used at any Publix store toward the purchase of merchandise, other than lottery tickets, money services, or where prohibited by law. No expiration date. Additional value may be added to the gift card at any time, at any Publix store. This gift card cannot be redeemed for cash or replaced if lost, stolen or damaged. For balance information refer to your last receipt or inquire at the customer service counter of any Publix store.